We are continuously enhancing and improving our management system in order to be a faithful company that has a meaningful presence in society. In order to enhance our overall corporate values and to fulfill our corporate social responsibility, we are always trying to improve our system of corporate governance, through which we establish our management objectives and to correctly implement the initiatives for achieving the goals. We have a Board of Directors, an Audit and Supervisory Board and Accounting Auditors, al l of which are indispensable corporate organs for our company&apos;s management. In addition, we have improved management efficiency by appointing Corporate Officers, to separate supervision and execution, as well as enhanced our corporate governance system through the system of internal audit and evaluation of internal control. This is the internal organization that makes management decisions on strategy and management targets. To clarify the management duties and responsibilities for the fiscal year, each Director is appointed to a one-year term of office. 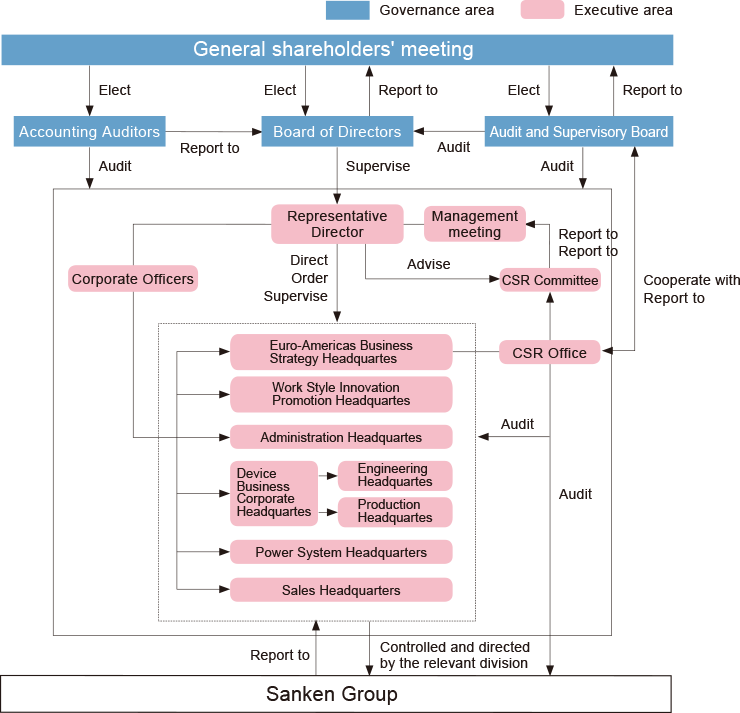 This is the internal organization that is responsible for supervising the Directors&apos; execution of operations and other operational control systems. Outside Audit and Supervisory Board Member s are also appointed. Ernst & Young ShinNihon LLC handles our external auditing. We are committed to achieve sustainable growth in our corporate values by promoting responsible corporate actions and conducts. 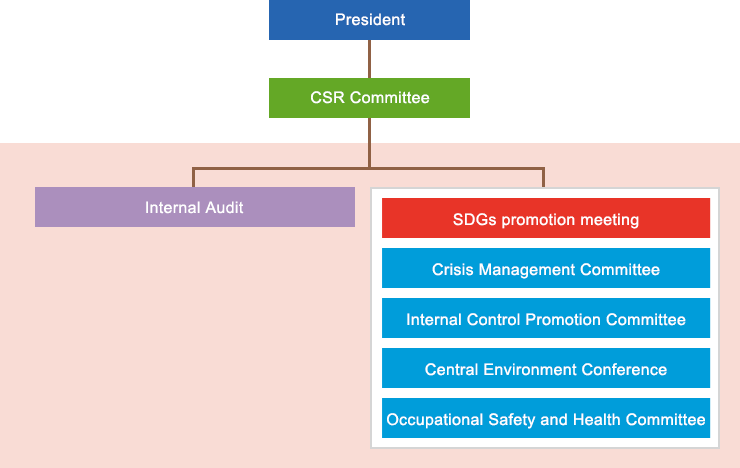 The CSR is delegated with the authority to promote our CSR activities as a cross-sectional dedicated internal unit in order to educate the entire organization spread and take necessary actions to bring about practical outcome. The CSR Committee, consisting of General Managers, controls the entire CSR activities done by Sanken group of companies. To maintain and promote a system that ensures reliable financial reporting as required by the Financial Instruments and Exchange Act, we have established the Internal Regulation Promotion Committee with the Director of the CSR Office as its chairman. We support inspection of operations conducted in each department of our company and Group companies and examine/evaluate the effectiveness of regulatory activities on a company-wide basis and at the level of each operational process. For internal regulation activities in the fiscal year 2017, we focused on reviewing of the control items in the operational process and improving the efficiency of evaluation efforts. Based on the Conduct Guidelines, we implement internal audits and monitoring, with the goal of the compliance with ethics laws, risk management, fraud prevention and detection, and improvement of management efficiency. As an audit method, after evaluating the importance and influence based on a risk-based approach, we perform an audit focusing on the selected themes. Further, by widening the application of the Computer Assisted Audit Techniques (CAAT) and implementing an audit according to managers' needs, we add value to internal audits (improvement suggestions) and support and promote management risk control. The results of internal audits are reported to management and auditors and are reflected in efforts to correct and improve the operations, systems, and their control methods within our company and Group companies. We also observe business activities through monitoring that regularly analyzes data accumulated in the core system. If an abnormal value is detected, it is fed back to the on-site department to urge improvement. Further, by providing compliance training through e-learning and booklets, and by issuing a compliance magazine, we are making efforts to raise compliance awareness and instill knowledge among the employees of our company and Group companies.